- It's time to grow! ¤ Our club has been organizing underground psy parties in Dublin for the last 3 and a half year with full heart and support. ¤ They are dedicated to all trance music, national and international. We can thank them for connecting all the psy crowd that can publish about artists, parties, videos, photos, decors, psy shops, and more. - Tadhg and Jack were both listening to mcfly from an early age, so it only made sense for them to team up and become the latest boy band sensation. Their combined looks and unforgettable dance routines make for a night you will want to never think about again. Expect a mass of hair, enough sweat to flood the river Liffey and a lot of god awful noise ! - ॐ MorgotH ॐ aka Bruno Rdm Borges, was born in Chaves , Portugal, in 1980. Started is passion for music very young starting with rock wen i got mi first vinyl present . Listening to all kind of music and genres , Heavymetal ,rock,punk,hardrock,chillout,darkambient,psytrance,darkpsy,forest,twilight ,Drum and bass and many more . I started listening to psy trance 1996 with some friend and it became mi passion electronic music in all there vertances. all in portugal till now . I love chill-out but one of mi passions is darkpsy,forest,twilight music. - Logicform is Psy project based in Dublin. Officially first Oggy Psy Dj. It’s all started in small room where he was invited by Ganesz ( Oggy Psy Club ), to play for few Psy heads every Thursday. Since then Logicform has played in Austria, Ireland and he has special upcoming gig in Slovakia,Hungary. This is going to be his first B2B performance with his mate and very talented Dj Juliosmap! We’re all looking forward to their set! 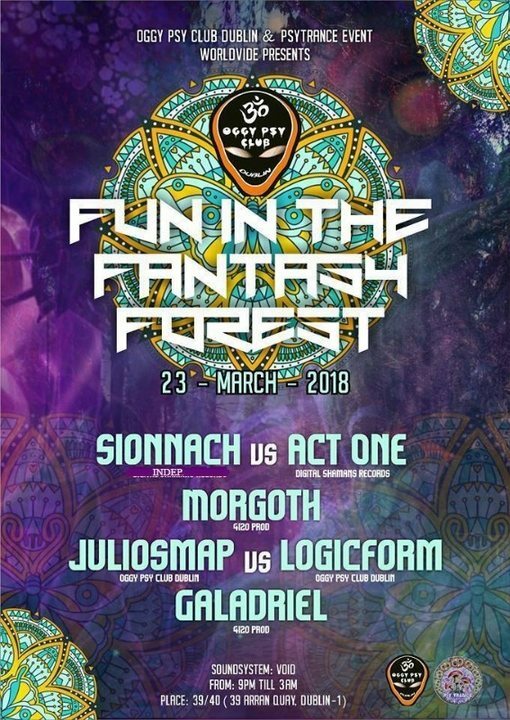 - JuliosMap and Logicform are joining their dance technics for this b2b that never happened before! Each one with their influences, flavors and connections with the music, they will try to bring something like the dark side of the progressive psytrance for all of us!